The Inspiration Award is presented to a Team NRGY Member who demonstrates perseverance, dedication and determination to overcome challenge. Their actions encourage others and that they, too, can excel in multisport. Their leadership in the face of adversity and continued support of Team NRGY inspires each of us. One might think overcoming cancer would be one’s sole focus. Kenneth rarely mentions his personal challenges. Instead, in the face of adversity continued to be an amazing teammate. 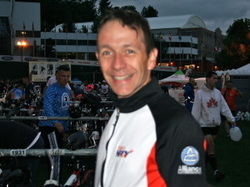 Kenneth has always offered advice on bikes, a place to stay and race support. While his countless acts are too many to count, I remember Kenneth helping to lug (and I mean lug) the Team NRGY tent across Lake Placid to set it up and one rainy morning, at 430am, he gathered up Tony and myself to head to Westchester and support our teammates who were racing. A gourmet cook Kenneth brought a meal over when I crashed. Kenneth is always putting others first. Kenneth always strove to give 100% of what he had to give even though, as he will admit was not always a 100%. Kenneth you are back! Thank you, Kenneth for inspiring those around you. We look forward to helping you achieve your personal goals for next year. Kenneth, it is my honor to present to you the 1st Team NRGY Inspiration Award. I received the Inspiration Award last year because of my stubbornness. Life dealt me a difficult hand that I was forced to deal with, and triathlon was my chosen weapon. I was so moved last year when Jason presented this award to me, that I couldn't even say any words of thanks. I could only shed tears as I realized that thanks to this sport, I was a cancer survivor. Somehow, I selfishly thought that I had been on my journey alone, and it was at that moment I realized I wasn't.This year, the Inspiration Award is going to a different type of inspiration. The type of inspiration that is motivated by the desire just to be the best that he can at everything he does. Let me read an excerpt from an email that embodies what I am talking about: "Kenneth, you are the best triathlete and coach ever. "….oops wrong email. "My colleagues/friends/family think I'm a bit nuts - but I've come to realize that triathlon is something I've needed in my life. I've always been active - just not always with focus. I've discovered that all of the "time" that it takes to train has made me a better husband, father, educator...It is possible, in my humble opinion, to pull it all off. Train hard. Train safely." I am pleased to be able to present this year’s Inspiration Award to someone who doesn't need something to push him into becoming an inspiration, because he already is. When I was going through the toughest moments of my life, he was an inspiration to me. Don't get me wrong, he's not perfect, but he never pretends to be. Our 2010 TeamNRGY Inspiration Award goes to: A loving husband; A devoted Father; A loyal friend; A two time Ironman; One of the original TeamNRGY members; And the funny thing is that he is so modest, that he still has no idea how much of an inspiration he is, or even that this award is for him. May we all learn something from him. Today, 2 ½ years later, he is a 170pound 2x Ironman that is the poster child for a healthy lifestyle. He doesn’t even have to think before jumping in a car or plane to go cheer on his teammates, and he does it all with an enthusiastic smile and two simple words, ‘Giddy Up’. This year’s TeamNRGY Inspiration Award Winner is Steven Richardson. His second triathlon was 7 days later at Metroman Sprint. 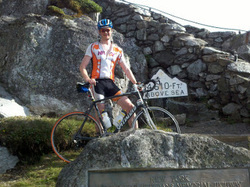 6weeks after Metroman, he finished Lake George Olympic. After Lake George, he asked me if I thought he could do an Ironman…..when I said that he had proven that he could accomplish anything…..he said, that’s good, because I already signed up for Ironman Texas. He became an Ironman less than a year after his first sprint triathlon, and became a 2x Ironman this year at Ironman Wales. Steven always approaches everything with a smile, He consistently goes out of his way to cheer on his teammates And has proven that with hard work, anything is possible. He changed his life….....and has no idea how many people he has inspired to change theirs. 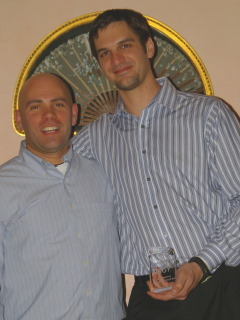 I’m honored to introduce the 2012 TeamNRGY Inspiration Award to someone that I am proud to call my friend, and is an Inspiration to all of us. Steven Richardson. Team NRGY is concluding it’s fifth year. Over these amazing days, months and years, we have each had the opportunity to be inspired by amazing teammates. The individuals who have won the inspiration award have each in their own unique way inspired each of us to be better people. The Inspiration Award is presented to a Team NRGY Member who demonstrates perseverance, dedication and determination to overcome challenge. Their actions encourage others and help them to believe that they, too, can excel in multi-sport. Their leadership in the face of adversity and continued support of Team NRGY inspires each of us.I fondly remember this individual’s start in triathlon. It was learning to swim. It was learning to bike. It was learning to run. It was a tug of war between golf and triathlon. It was constant pain in his foot. This year’s award recipient Mark Silverstein through perseverance, dedication and determination embodies the essence of the Inspiration award. Everyday, month and year this individual courageously tackled a little more. 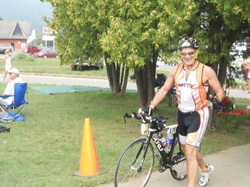 From sprints down the shore in 2010 to two half Ironmans in 2011. As the itch to compete, thoughts of Ironman danced in his head. In July 2012 - maybe it was a dare or prodding from his coach or teammates - this individual decided for his 60th Birthday he would conquer the toughest one day sporting event in the world, Ironman. Golf would be on the back burner. Do you still own golf clubs? 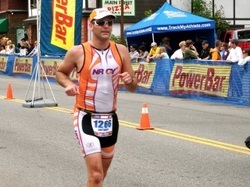 As the excitement and training ramped up for Ironman, everything Mark touched was a PR. However the PR’s came with a price, more pain in the foot. There would be one more required “step” to make ironman happen. Massive foot surgery and cast. It was November then December - less than 7 months away from Ironman Lake Placid and his foot was in a cast. He continued to work on his core and general strength. Mark was determined to be ready when he cast finally came off. One step at a time - and I do mean step - the miles started to add up. The confidence came back! His perseverance and dedication is something we all admired. Everything was headed towards success at Ironman. But wait, there is more. Wouldn’t you know a few weeks before Ironman - a crack in his bike frame was discovered. Maybe there was a little panic, but he handled it like a champion. There was the shipping snafu with GURU (his bike frame ended up in Wisconsin not NJ). CycleCraft got him a ride for Ironman. A couple quick spins and the frame was good. Then in Lake Placid it was discovered that front wheel was out of true. Rent a pair of wheels. Things come in threes, right? The third…his timing chip was not working. He swam and rode 112 miles with no splits - good job on making your family panic. I patiently waited with Tracey for Mark to come off the bike - and then got to explain that his chip was not working all day. We got it switched out. He handled it like a champion. a few hours later - Mike Reilly called Mark Silverstein an IRONMAN. Words that must have sounded so sweet. Mark has overcome much. He learned a new sport. He gave up his golf clubs. He overcame serious foot surgery. He gave up time with his loved ones. No matter what life threw in front of Mark, he has demonstrated courage to preserve, dedication to succeed and determination to reach his goals. Mark, please come forward to accept the 2013 Team NRGY Inspiration Award. Everyday, I am amazing by our teammates. The Inspiration Award was created in 2009 to honor a Team NRGY Member who demonstrates perseverance, dedication and determination to overcome challenge. Their actions encourage others and help them to believe that they, too, can excel in multi-sport. Their leadership in the face of adversity and continued support of Team NRGY inspires each of us. This year’s winner has been a visible member of Team NRGY since 2010. Fifteen months ago, Mary Sue Youn asked me if she could complete Ironman Princeton 70.3 – there was a lot to consider – she is a Director at College Coach – Girl Scout Troop Leader – Mother of Two beautiful daughters and she was the Class Chair for her 20th Reunion Celebration at Cornell. We agreed with careful planning that it would be possible. So she embarked on the training – a journey that would not only change her life, but the life’s of everyone around her. We had one of the worst winters in terms of snowfall. The obstacles of a hectic schedule and mother-nature did not deter Mary Sue. She continued the course, logging hours on the trainer, time in the pool and laps around Brookdale Park, one of the only safe places to run. 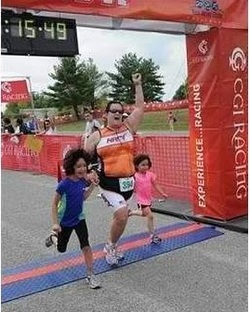 She ran the half marathon. She came to camp fighting exhaustion and bronchitis and when most would have given up – she manned the aid station knocking out miles on the trainer. She completed a bunch of tune-up races along the way. Be grateful. Be Brave. Those words have echoed in my head for a couple months now. Those are the words Mary Sue inscribed on her arm before Princeton. We are all grateful to have Mary Sue in our lives. She is one of the bravest individuals I know. This year’s winner Mary Sue has opened her heart to all of us and in return I ask you all to join me in giving her a much-deserved standing ovation. 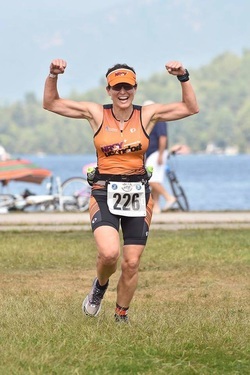 I've admired Fran's success, watching her train and race over the last couple of years as a member of TeamNRGY, so when she asked me to coach her for her first 1/2 Ironman race at Lake George this year, I was happy and proud to do so. I knew that she would be an excellent athlete to coach, given her determination, focus and wicked sense of humor. What I didn't expect is the depth of her reserves in all these areas. two stink-eye looks at her coach for putting her through the grinder. Fran was faced with challenges that would have stopped many people cold, and rightfully so. But watching her face them down, and find a way over, around or right straight through them was an inspiration for me. Please join me in congratulating an amazing athlete, and my good friend, Fran Caggiano-Swenson!